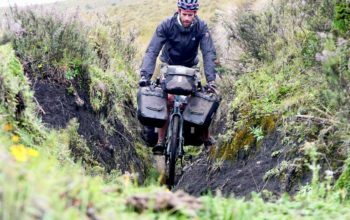 Dynamo hubs are quite widely adopted in the bicycle touring, bikepacking and ultra racing scenes. With LED light technology allowing for 1300 lumen (or 100+ lux) light outputs, USB charging for gadgets and lithium ion battery storage – dynamo hubs feel like the right way to harvest energy. But where does this energy come from, and to what extent does it slow us down? If you’ve ever picked up a dynamo hub and tried to spin the axle, you’ll know that they feel incredibly ‘notchy’. This is the result of a series of powerful magnets passing a coil and in turn, creating an electric charge. The writers at FahrradZukunft put together some lab tests a few years ago to find out more about dynamo hub drag. Let’s take a look at their testing, the data and then draw some conclusions about the effect of dynamo hub drag on our speed. 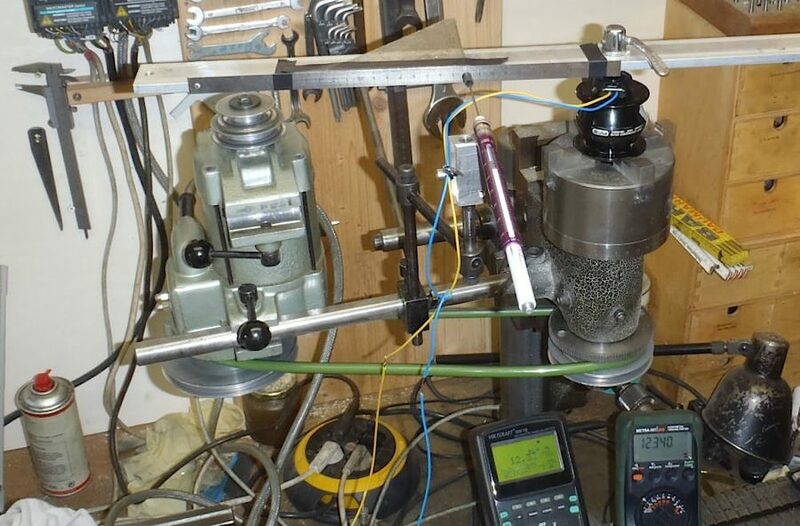 The different dynamo hubs were clamped into a lathe and spun to different speeds. The speed was determined simply by measuring the frequency of the generator with the known number of pole pairs. A supporting load was applied to the opposite end of the hub to replicate the downward force of a fork, and a 12-ohm electrical load resistor is connected to replicate a standard dynamo lighting system. With everything setup, the drive power is then calculated. 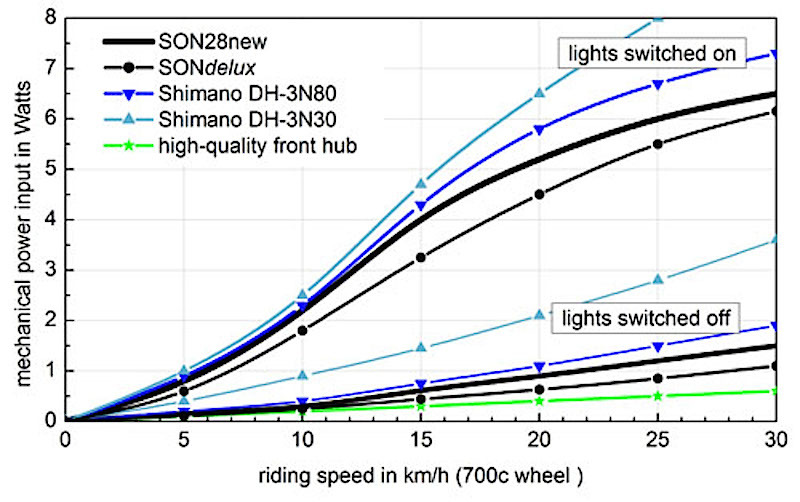 The lowest drag hubs with the light switched OFF are the SON hubs. They’re rolling almost as efficiently as a regular hub despite having the dynamo infrastructure. The SP Dynamo hub is the next most efficient, followed by the Shimano DH-3N80 hub. 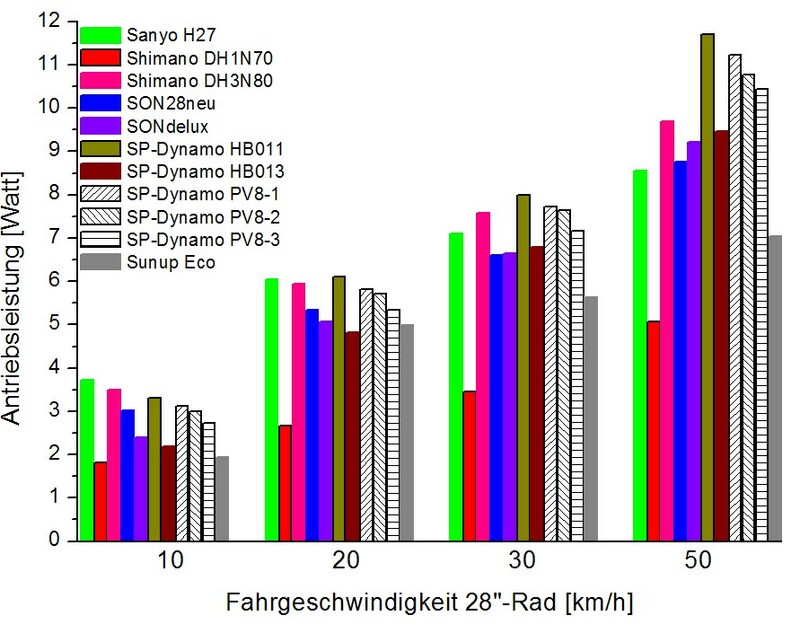 The Sanyo H27 is clearly the least efficient dynamo hub on test and was almost 5x less efficient than a Schmidt hub at 30km/h! The lowest drag hub is the SONdelux. 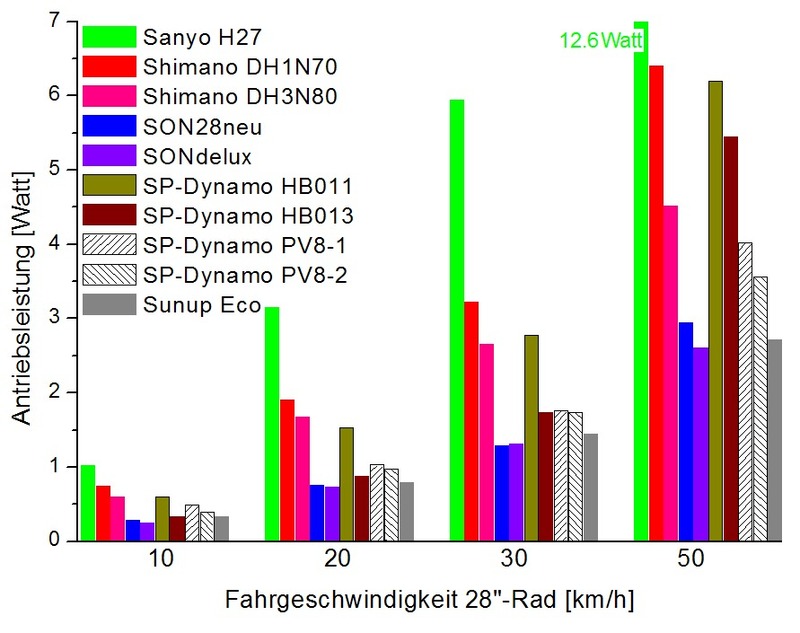 Next is the SP Dynamo which achieves a marginally lower drag than the SON28 at 10km/h, but is 0.5w higher at 30km/h. 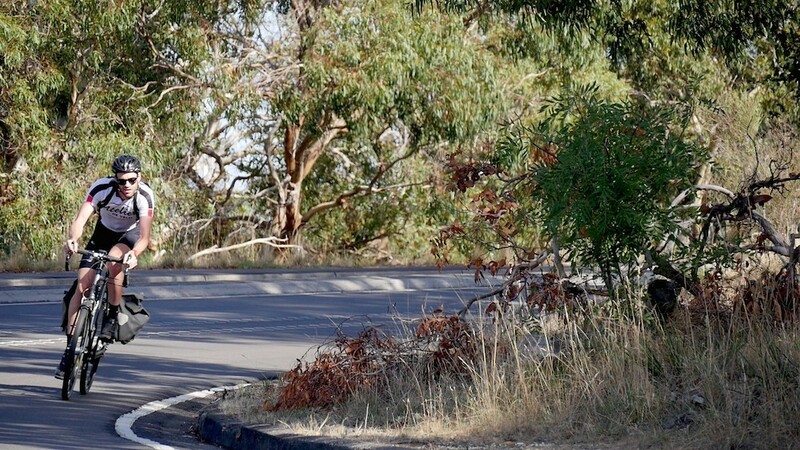 The Shimano DH-3N80 performs well at slower speeds, but is the least efficient hub option at 30km/h. The Sanyo H27 is surprisingly efficient when switched on, in fact, it’s MORE efficient than the more expensive options at high speeds! Schmidt have conducted their own testing for the SONdelux, SON28 and Shimano DH-3N80 hubs. The results fall very closely in line with the independent testing conducted by FahrradZukunft, but their data shows slightly less drag on all three hubs between 10-30km/h. This could be due to a different electrical load applied to the hubs. We now have an idea of the numbers, but how does this translate in terms of speed? 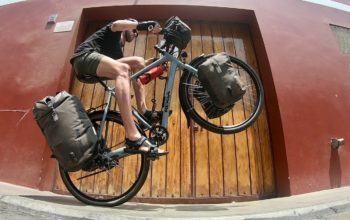 Let’s compare two different rider weights (60 and 80kg) and gear weights (15kg and 30kg). I’ll adjust the power (effort) to be more in line with each of those rider weights too (100w and 150w). 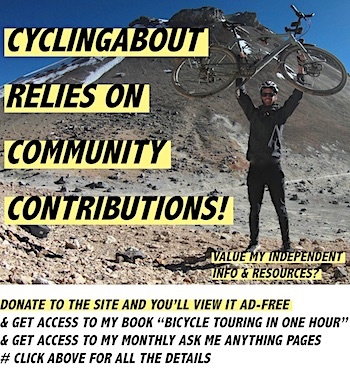 We can assume the drag of a non-dynamo hub is 0.5 watts. I’ve taken the dynamo hub drag at the different speeds and subtracted 0.5 watts in order draw a direct comparison. The calculations have all been done with BikeCalculator.com which I’ve found to be very accurate from prior testing. 60kg rider / 15kg Bike and Gear / 100 watts / Non-Dynamo Hub = 24.34km/h. 60kg rider / 30kg bike and gear / 100 watts. 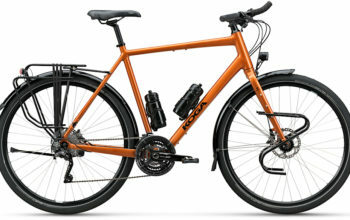 Non-Dynamo Hub = 23.83km/h. 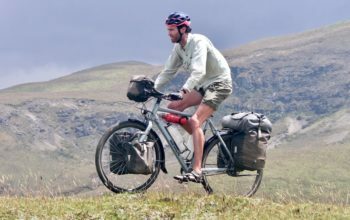 80kg rider / 15kg bike and gear / 150 watts. Non-Dynamo Hub = 27.96km/h. – The most efficient dynamo hubs when switched OFF add between 17 and 30 seconds to a flat ride over 100km when compared to a regular hub. 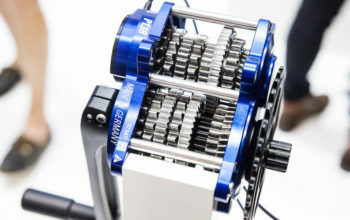 – The most efficient dynamo hubs when switched ON add between 3min 24sec and 5min 47sec to a flat ride over 100km when compared to a regular hub. 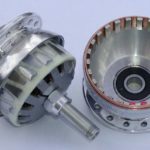 Does Dynamo Hub Drag Really Matter? 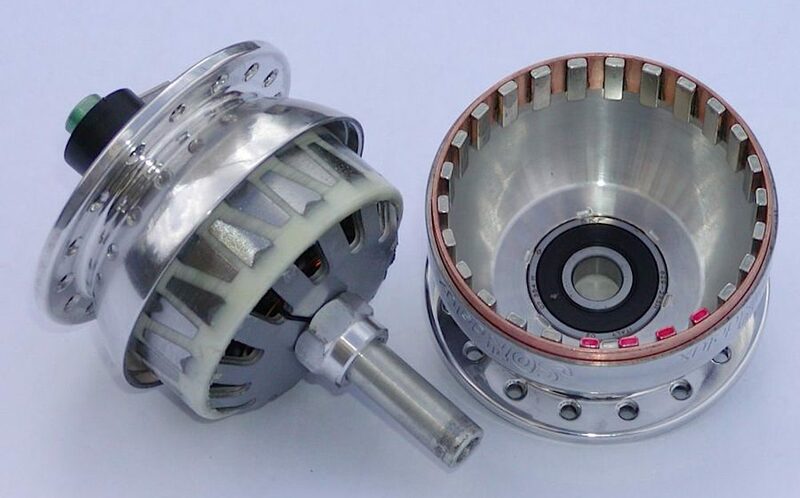 Given the leverage of a wheel and the flywheel effect of the rotating mass, dynamo hub drag only has a small effect on your speed. 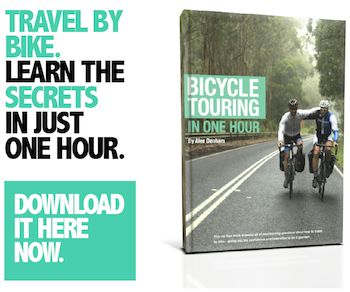 The result for most people is likely to be an extra three to six minutes riding time over 100km, all while getting a good charge to your electronics (or while running lights).